Quality over quantity, right? “But wait”, you say. “I thought that adding more content and blogs would help boost my site’s SEO rankings?” Well, yes and no. Simply cramming your website full of unfocused, aimless ramblings is actually a sure fire way to earn the ire of both your readers and search engines. When it comes to web content, Google sets the objective standards for what qualifies as “high quality”. Once upon a time, SEO rankings were determined by easily exploitable metrics tied to keywords and page links, which led to far too many websites gaming the system by overloading pages with irrelevant keywords and misleading links in order to get more traffic and higher rankings. The problem here is that these webpages didn’t provide the information that they claimed, resulting in a bad experience for users and prompting Google to set their sights on punishing these types of sites. While elements like keywords and page links are still hugely important to your SEO rankings, and towards convincing readers that your website will provide them with what they’re looking for, the way in which Google analyzes and aggregates content is constantly evolving. So, more content or more relevant content? Ideally you would be aiming for both, but your focus should be on putting out high-quality content that resonates with your audience. Some of you may have heard the term “click bait”. This refers to websites and online articles that attempt to get the most traffic to the page as possible, with little regard for how relevant or useful the information will be to readers. These flash-in-the-pan approaches will only hurt websites in the long run as they lead to high bounce rates and low engagement, which is a huge red flag to the search engine gods. High SEO rankings are not built overnight. They’re built over time by creating a constant and consistent flow of relevant, high quality content. While playing by the rules is important, it’s only half the battle. If your content isn’t unique or offering readers something new and different, what incentive do they have to read it? Chew on this: 41% of consumers would end a brand relationship because of irrelevant content and promotions. If you’re flooding your readers with junk content, or the same nearly-plagiarized content as someone else, all you’re doing is giving them a reason to actively ignore you. You would be better suited not saying anything, than saying something just for the sake of saying something. At least twice a month, I receive snail mail from a well-known mortgage lender informing me that I could reduce my mortgage payment by up to $1,000 per year. Sounds like a super sweet deal, but I rent an apartment, so the content is all but wasted on me. In the event that I do purchase a home, the chances of me working with that particular company are highly unlikely because they’ve already lost my attention. Consumers aren’t stupid. After decades of being exposed to every kind of marketing, advertising, and sales pitch known to man, they’ve learned to separate disingenuous schemes from authentic communication. You need to show your audience that you want to connect with them on a personal level by creating content that they feel will address their individual needs. Geoffrey James of Inc. Magazine describes the three levels of empathy that can help you connect with your audience. This is the ability to sense what customers want. At a basic level, you understand your audience and what it is they’re looking for. This means going beyond understanding a customer's problem and figuring out how to address it. A potential customer usually has a problem that they know they need addressed. Your content at this level needs to directly address that problem and provide the solution to it. Perhaps the most powerful form of empathy, this means you’re able to create solutions for problems before customers even know that they have it. This is the true heart of real innovation and where you can create the most relevance to distance you from your competitors. The takeaway here should be this: when it comes to your web content, either tell the same story better, or tell a different story altogether. This might seem like common sense, but far too many organizations simply look at what works for others and then try to copy them. Don’t be afraid to do something different, it just might get you noticed. 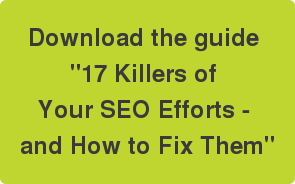 Download the guide "17 Killers of Your SEO Efforts - and How to Fix Them".